1. Preheat the oven to 190˚C, gas mark 5. 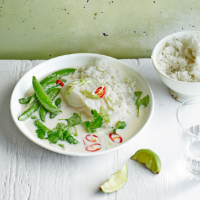 Tip the coconut milk into a pan, add the garlic, ginger and ½ the sliced chilli. Set over a low heat and simmer gently for about 4 minutes to infuse. Add the sweet chilli and fish sauces, then take off the heat. Meanwhile, cook the rice according to pack instructions. 2. Arrange the cod in an ovenproof dish, pour over the coconut milk mixture and bake on the middle shelf of the oven for 15 minutes, until cooked through. Scatter over the coriander, salad onion and reserved chilli. Serve immediately with the rice and some lime wedges and sugar snap peas, if liked.